I’m coming from a different perspective on this one. I wanted to create a comfortable and charming environment where your Sims could have fun and spend more time outdoors without getting bored. I started with a big pool and then moved on to landscaping; parks, pond, fountains, paths, and driveways. Finally I fitted the structures/buildings around whatever space was left which was a bit challenging but fun. This is a resort style, modern luxury mansion with all basic needs and a flexible architecture that responds to change. It could be used as a small, medium or large family home. 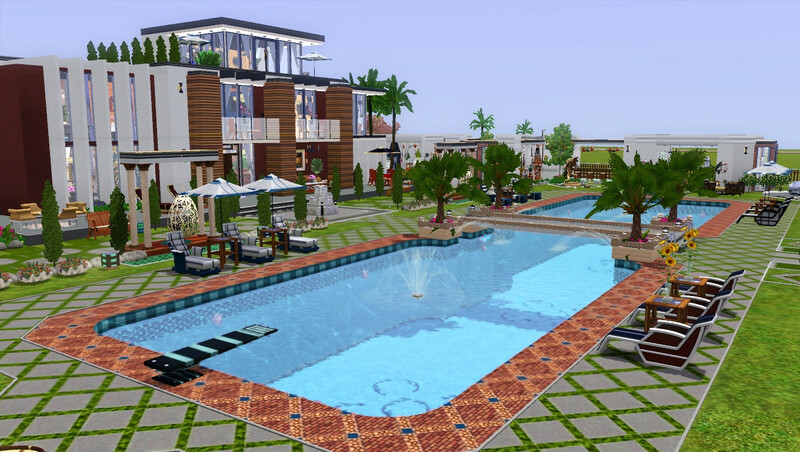 It could also be used as a community lot such as a wellness center/clinic, resort/holiday hotel, etc. All structures are modifiable to suit your style; the choice is yours. It has two main buildings; the first building in front comprises 3 small houses with different heights linked together by a bridge and functions as a unit with the stargaze tower included. On the west side is the guest house with an open living, kitchen, and dining areas, 1 bed, full bath with private laundry, study, and 2 balconies (one has a private bar, BBQ, dining and relaxation areas). The built-in bookshelf under the stairs next to the guest house is fully functional. The middle house is the entertainment area; it features an open plan living, kitchen, and dining areas, a half bath, 2 bars, game and multiple seating areas, study, and 2 balconies (one has a good view to the pool area and its surroundings). The house on the east has two spacious ensuite bedrooms (one has 2 balconies) with a common laundry room, kitchen, seating areas, study, and a half bath in the shared room downstairs, and both have direct access to the stargaze tower. The second building (back) which is actually the fourth house also has an entertainment area on the first floor with an open plan living, kitchen, and a separate dining room, study, half bath, game area, multiple seating and relaxation areas. The master ensuite is on the second floor and features a private stairway and balcony with great view to the pool and its surroundings. It also offers a separate living room, bedroom, and dining areas, office, study, and a shared laundry room. Also on the second floor is another spacious ensuite bedroom with a balcony facing the pool. The main library is located on the third floor; it has a large balcony with seating, relaxation areas, and a panoramic view of the lot and its surroundings. The outdoor environment offers 2 poolside parking spaces with private driveways, a large swimming pool (ideal for parties), foot massage, poolside seating, and relaxation areas, 6 small parks for recreational activities, fish pond, outdoor shower next to the gym, artist easel, game and picnic areas. The T-shaped buildings feature 2 kitchens with BBQ, 2 poolside bars, 3 half baths, sauna, hot tub, body massage, open-air gym, fireplace, study, artist room, game area, multiple seating, relaxation, and dining areas. I added few walls to the T-shaped buildings to preserve an open look and feel of the environment but you could add walls, windows, and/or glass roofs as needed. All breakables upgraded and burglar alarms in designated areas. Please note: the flat screen TV in the hot tub room (T-shaped building, West) is functional but not useful; it’s just a deco to make it look nice. 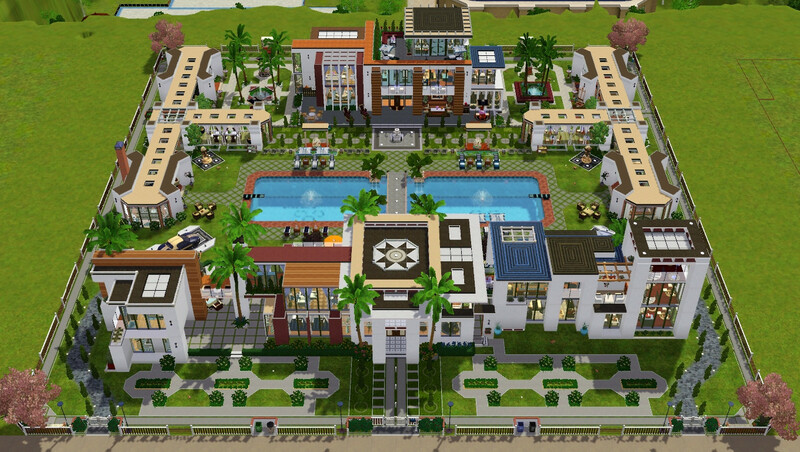 As always, all floor plans, builds, pattern, and deco styles by me but you will need Late Night, Showtime, 4Sps, and store contents (deco items) to make it look exactly the same otherwise they will be replaced with standard items. Place anywhere on a flat lot. If you encounter any issues, please comment or send me a PM. Store Contents: the store contents are deco items (plants, pictures, furniture) which do not have any impact on the builds or function of the game and could be replaced as needed. It will be hard to know where to start in exploring this. So much to look at. Oh my gosh, I totally love this house! It's just... wow! Hello. First of all, I have been an absolute fan of you Camdice Retreat house since you posted it last year and made it my main family home ever since. 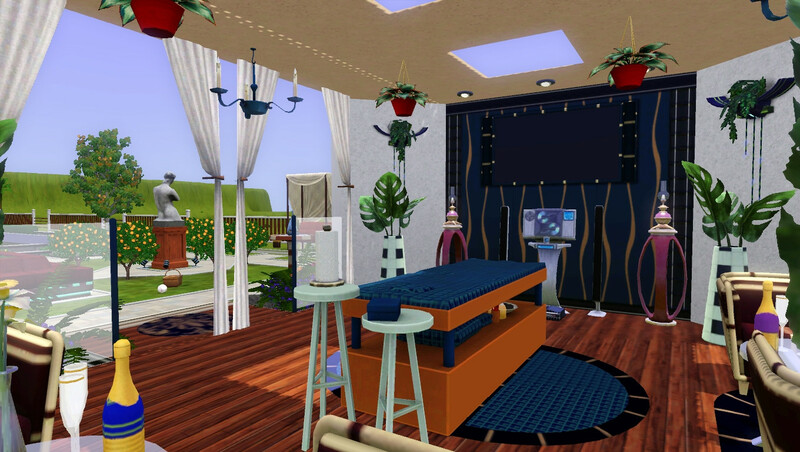 But now I just saw this new house and tried it on my PC and my jaws dropped. Um... this is just mind blowing, astounding and perfect work. I could NOT believe how artistic you are designing such luxurious vacation houses but I think if you were a real world home designer, people would scream to buy one of your architectural creations, even the most snobbish celebrities. This is simply wonderful. You have no idea how much this new home totally fits my own taste and how much I'd wish I had such an opulent charming home. I am a terrible builder in Sim games, and I prefer playing custom house in live mode, making my families and watching them evolve. Since last year, your houses have been the best I came by, in my opinion. I have created an account here on Mod The Sims, in order to say thank you to you for your work and the time you take to share your talent to us Simmers from around the globe. Thank you very kindly. #9 7th Jun 2018 at 12:47 PM Last edited by toolowforzeros : 8th Jun 2018 at 3:10 PM. This is an amazingly complex build, wow! Amazing. So very creative, I love this. Heading off to download and explore in game. Well done! 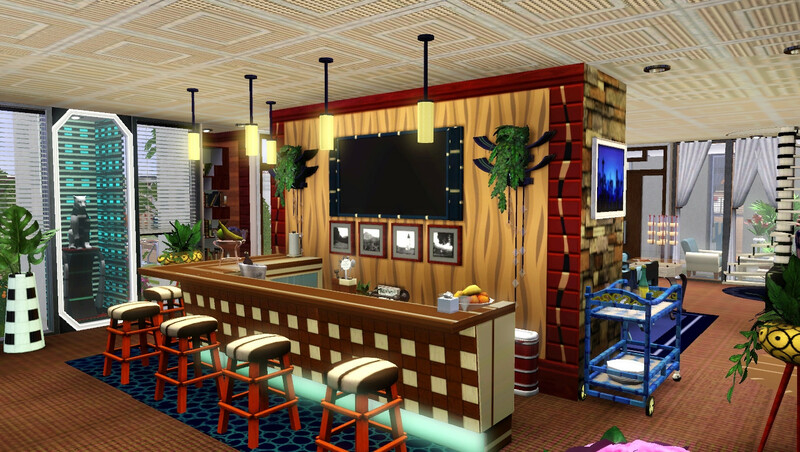 I agree with all other comments this is a creative stunning lot and I look forward to my sims exploring it, thank you so much..
What a great great work. How long do you work on this?